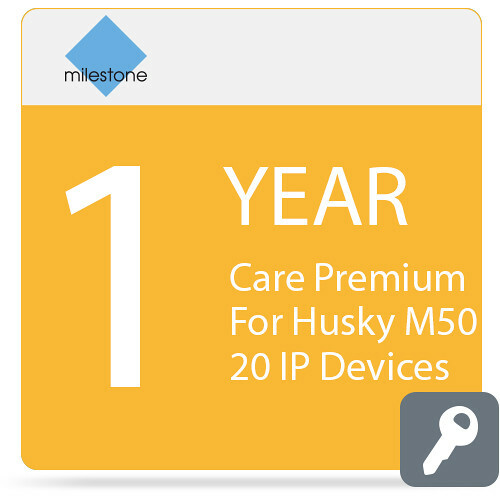 Purchase one year of Care Premium for Husky M50 from Milestone for round-the-clock technical support from a Milestone expert for addressing software and device issues that may arise on up to 20 IP devices. Care Premium provides end users with a quick solution for technical issues pertaining to installation or everyday use of Milestone Husky M50 devices. For a complete solution, a base license must be purchased for each VMS, and a device license must be purchased for all connected cameras. Note: This is an add-on and users must purchase Milestone Care Plus software as a prerequisite. Purchasers will be contacted by a customer service representative to confirm the serial license codes of the required software.